In a monastery of Benedictine spirit, the praise of God, which the monks sing as a solemn choral prayer, always has priority. Monks are certainly - thank God! - not the only people who pray; others also pray: children, the young and the old, men and women, the married and the single - all Christians pray, or at least, they should! In the life of monks, however, prayer takes on a particular importance: it is the heart of their calling. Their vocation is to be men of prayer. In the patristic period the monastic life was likened to the life of the angels. It was considered the essential mark of the angels that they are adorers. Their very life is adoration. This should hold true also for monks. Monks pray first and foremost not for any specific intention, but simply because God is worthy of being praised. "Confitemini Domino, quoniam bonus! - Praise the Lord, for he is good, for his mercy is eternal! ": so we are urged by a number of Psalms (e.g. Ps 106:1). Such prayer for its own sake, intended as pure divine service, is rightly called officium. It is "service" par excellence, the "sacred service" of monks. It is offered to the triune God who, above all else, is worthy "to receive glory, honour and power" (Rev 4:11), because he wondrously created the world and even more wondrously renewed it. An attentive look at monastic history through the ages reveals that dedication to the primacy of the Divine Office has variously waxed and waned. Where it has waxed, the monastic grace has wonderfully flourished; where it has waned, every other dimension of monastic culture has suffered in consequence. Cult (from the Latin cultus for worship) is, in fact, the matrix of culture. What about those monasteries in which, in addition to the daily Conventual Mass and choral celebration of the Divine Office, there were various expressions of Eucharistic adoration? Looking at history, one notes that while monastic houses of women adorers abounded after the thirteenth century, especially in the Low Countries, few houses of men militating under the Rule of Saint Benedict were inspired to make a similar corporate commitment to adoration of the Most Blessed Sacrament. 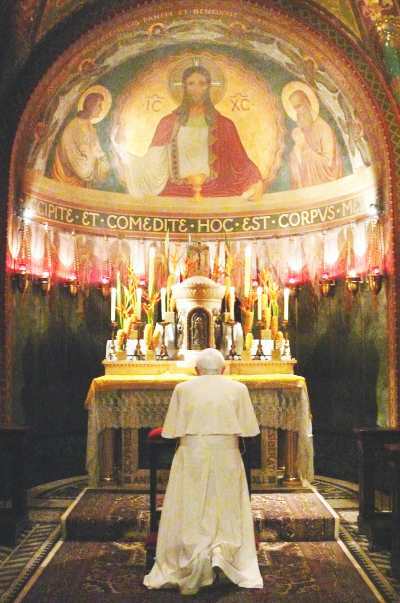 Undoubtedly, there was a lurking and not altogether unfounded fear, that Eucharistic adoration, perpetual or otherwise prolonged, assumed in addition to the daily round of the Opus Dei, would lead to a loss of the characteristically Benedictine value of balance and moderation. The first monks under the Rule of Saint Benedict to adopt Eucharistic adoration as an identifying characteristic belonged to the Umbrian Congregation of Corpus Christi, founded by the Blessed Andrea di Paolo in 1328. The Monks of Corpus Christi, or Corpocristiani were aggregated to the Benedictine Congregation of Monte Oliveto by Pope Gregory XIII in 1582. The last Corpus Christi Benedictine, Tommaso di Bastiano di Sterpete, of Foligno, died in 1640. The Picpus Fathers, so called from the street of their first house in Paris, were founded under the Rule of Saint Benedict in 1800 by Father Pierre Coudrin and Mother Henriette Aymer de la Chevalerie. The full title of this religious family is a very long one but it expresses completely their founding grace: "The Congregation of the Sacred Hearts of Jesus and Mary of the Perpetual Adoration of the Blessed Sacrament of the Altar." Although members of the Congregation would identify themselves as missionary rather than classically Benedictine, the Rule of Saint Benedict remains for them a reference, and Eucharistic adoration is integral to their charism. The most famous member of the Congregation of the Sacred Hearts is Saint Damien of Molokai. Father Damien's compassionate devotion to those suffering from leprosy was the fruit of the intimate knowledge of the pierced Side of Christ that came to him in long hours of adoration before the tabernacle. It is a little known fact that Father Damien laboured to establish perpetual adoration of the Eucharist among his dear lepers. In this there is something astonishingly beautiful; the sight of lepers adoring day and night the Suffering Servant who, disfigured in his Passion, became, "as one from whom men screen their faces" (Is 53:3), the "Lord of Glory" (1 Cor 2:8) whose face is "all the beauty of holy souls" (Litany of the Holy Face). To the best of my knowledge, the next foundation of monks identified by Eucharistic adoration emerged only in 1892 when Dom Marie-Bernard Maréchal, a former Priest of the Congregation of the Blessed Sacrament and disciple of Saint Peter Julian Eymard, established the Abbey of Pont-Colbert near Versailles, France, for the Cistercian Adorers of the Most Blessed Sacrament. Father Paul Maréchal, later Dom Marie-Bernard, left the Congregation of the Blessed Sacrament after the death of Saint Peter Julian Eymard, when his proposal to have the Blessed Sacrament Fathers adopt the Rule of Saint Benedict was rejected at a General Chapter of the Institute. In the wake of persecutions by the anticlerical French government at the beginning of the last century, the Cistercian Adorers of the Most Blessed Sacrament migrated to Marienkroon in Holland. Marienkroon, in turn, founded in 1929 the now defunct monastery of Val d'Espoir in the Canadian Gaspé peninsula, and brought its influence to bear upon the Abbey of Our Lady of Spring Bank in Sparta, Wisconsin. The Olivetan Benedictine, Dom Celestino Maria Colombo, was appointed abbot of the Sanctuary of La Madonna del Pilastrello at Lendinara (Rovigo) by motu proprio of Pope Benedict XV on 15 December 1920. Abbot Celestino Maria was a devoted and tireless spiritual father to the Benedictine Nuns of the Perpetual Adoration of the Most Holy Sacrament of the Monastery of Ghiffa. Later, he exercised the same role monasteries aggregated to Ghiffa in central and southern Italy, including that of Piedimonte Matese, which monastery I have known for thirty-five years. After having studied in depth the Constitutions and books of the Institute, after having practiced the spirit of them to an heroic degree, after having grounded the community in this same spirit, with a patient, enlightened, and prudent zeal, he asked for the grace of possessing our holy habit, of practicing our holy Constitutions, of being a true member of the Institute, a true victim of the Most Holy Sacrament. The nuns, in a unanimous joy, received the eucharistic vow of the Reverend Father. Since that day uninterrupted requests and prayers have been raised to heaven so that the Institute will have, at last, its complement to the glory of the Eucharist and so that the last breath of our great father Benedict will generate sons of the Host to the Host, Benedictine Adorers, the priestly victims to sustain and save the Church in the difficult last times. And so may it be. The location of a little sanctuary dedicated to the Most Holy Trinity near the monastery of Ronco di Ghiffa, revived in Dom Celestino a desire that had never gone away: the birth of a Benedictine community of men dedicated to adoration and reparation of the Eucharist. One reads in the same Annals, that coming down, one day from the Sanctuary of the Most Holy Trinity to the monastery, he expressed "the wish that Eucharistic Benedictine Fathers would come one day to the Sanctuary of the Most Holy Trinity." It is probable that this lively aspiration was never erased from the heart of Dom Celestino, enamoured as he was of the Eucharistic ideal proposed by Mother de Bar, and lived so well by the nuns of the monastery of Ghiffa. 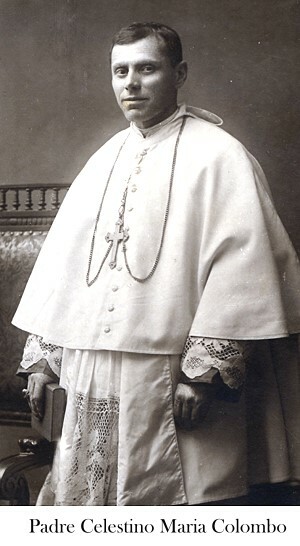 He had absorbed and appropriated for himself the spirit of the Benedictine Institute of Perpetual Adoration, to the point of living it faithfully and fostering its growth in every possible way until his saintly death on 24 September 1935. We are asking, therefore, all diocesan Ordinaries who apprehend in a particular way the specificity and irreplaceability of the ordained ministry in the life of the Church, together with the urgency of a common action in support of the ministerial priesthood, to take an active role and promote--in the different portions of the People of God entrusted to them--true and proper cenacles in which clerics, religious and lay people --united among themselves in the spirit of true communion--may devote themselves to prayer, in the form of continuous Eucharistic adoration in a spirit of genuine and authentic reparation and purification. Each diocese appoint a priest who will devote himself full time - as far as possible - to the specific ministry of promoting Eucharistic adoration and coordinating this important service in the diocese. Dedicating himself generously to this ministry, this priest will be able to live this particular dimension of liturgical, theological, spiritual and pastoral life, possibly in a place specifically set aside for this purpose by the bishop himself, where the faithful will benefit from perpetual Eucharistic adoration. With these concerns and exhortations in mind, and with the good of the priests and indeed all the faithful of the Diocese of Tulsa close to my heart, it is my intention to respond to these timely suggestions of the Holy See to the best of my ability. Reflecting upon our particular needs, and upon the current resources with which we are blessed, it seems that such an endeavor might best be accomplished by a new monastic community under the Rule of Saint Benedict. Rather than have only a single priest dedicated to Eucharistic adoration for the sanctification of the clergy, I deem it advantageous to enrich our local Church with a monastic community to whom I give this particular mandate. Professing the vows of stability, conversatio morum, and obedience according to the Rule of Saint Benedict and the Constitutions of the Monastery of Our Lady of the Cenacle, the Benedictine Monks, Adorers of the Eucharistic Face of Jesus will be characterized by the particular charism of (a) Eucharistic adoration for the sanctification of priests and the spiritual renewal of the clergy in the whole Church; (b) reparation for the sins that disfigure the Face of Christ the Priest; and (c) the sacramental and spiritual support of the clergy by means of monastic hospitality, spiritual direction, and retreats. For my part, I can only recommend our new beginning in Stamullen, County Meath, Ireland, to the fervent prayers of all my readers. Our initiative springs, not from any personal ambition, but from the very heart of the Church: Ecclesia de Eucharistia.